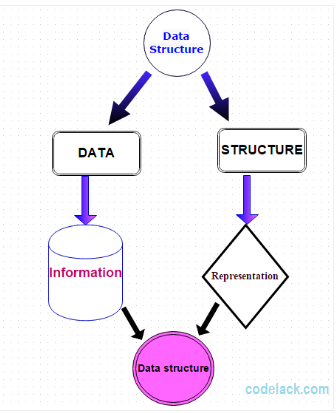 Data structure is a way of representation of relationship between logical related data elements. Data may be organized in many different ways . The logical or mathematical model of particular organization of data is called data structure. DS= organized data + Allowed operator. In data structure, decision on the operation such as storage, retrieval and access must be carried out between the logically related data elements only. Data structure always describe about data representation in memory. These are basic data structure and are directly operated upon by the machine instruction. These are more sophisticated data structure these are divided from Primitive data structure. the Non primitive data structure emphases unstructured of a group of heterogeneous and non homogenous data .